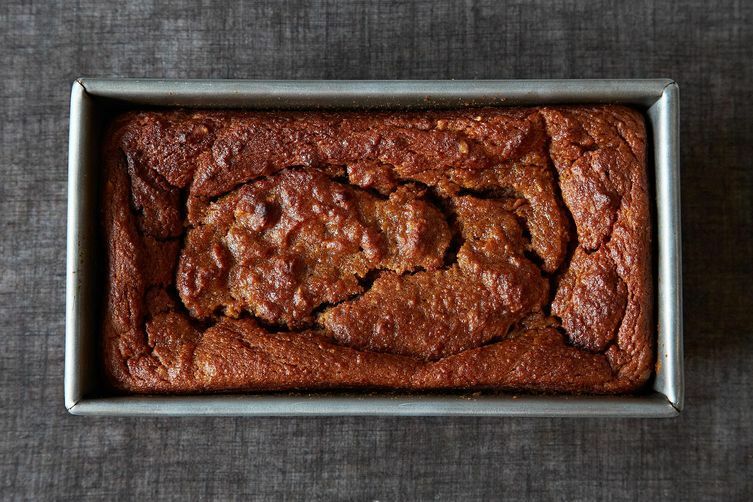 Today: A pumpkin bread true to its name. If you’re on the hook for Christmas morning breakfast and you’re feeling a bit cheeky about the whole thing, how about The Pumpkin Bread I Can't Stop Eating? While most pumpkin breads tend to be on the drier and heavy side, Giulia Melucci -- as is her wont -- has given this staple a little twist. The result in a highly moist and surprising holiday staple, but one that requires a little extra time in the oven. This bread has all the traditional spices, but employs olive oil and some apples, which contribute greatly to its moisture. But that also means a fairly long cooking time;I could not get this mama baked in under 90 minutes. So wake up first, please, or make it the night before -- an even better idea. The fruit in this may throw off some purists but keep an open mind. No. There is no ginger. Maybe nutmeg? Nuts, as ever, are optional; I would prefer pecans. In short, this is a great treat for those who like their pumpkin breads on the moist side, and who enjoy a morning debate about pumpkin breads we have known. Now, we’re moving on to Bûche de Noël. Could you use unsweetened apple sauce, and, if so, in what measurement? Actually, the original recipe was updated to make a few changes re: the pudding-like consistency. If you click through you'll see the updated recipe that according to comments works a lot better- maybe they can update the version on this page, too. I just read the comments on the recipe page for this recipe. It seems that the original recipe had to be modified because it was far too wet. I think these ingredients listed here need to be modified, too, or you're going to end up with a pudding, not a bread. I'm confused. On this page, you call for a whole can of pumpkin (15 oz) and 2 apples. But on the recipe page, you call for only 1 cup of pumpkin and 1 apple. That seems like a big difference. Any help on this from the author? Can an all purpose gluten free flour be used successfully in this recipe? I'm not a pumpkin fan but I was having a brunch for a fair number of people and I wanted a bread like banana bread but not banana bread. I baked this and it's really good. I love the texture, the flavor, well all of it. It's one of the few food items that disappeared. Thanks again, Jenny. And thanks Guilia.